Capsaicin, the pungent ingredient of red pepper has become not only a “hot” topic in neuroscience but its new target-related unique actions have opened the door for the drug industry to introduce a new chapter of analgesics. After several lines of translational efforts with over 1,000 patents and clinical trials, the 8 % capsaicin dermal patch reached the market and its long-lasting local analgesic effect in some severe neuropathic pain states is now well established. This introductory chapter outlines on one hand the historical background based on the author’s 50 years of experience in this field and on the other hand emphasizes new scopes, fascinating perspectives in pharmaco-physiology, and molecular pharmacology of nociceptive sensory neurons. Evidence for the effect of capsaicin on C-polymodal nociceptors (CMH), C-mechanoinsensitive (CHMi), and silent C-nociceptors are listed and the features of the capsaicin-induced blocking effects of nociceptors are demonstrated. Common and different characteristics of nociceptor-blocking actions after systemic, perineural, local, intrathecal, and in vitro treatments are summarized. Evidence for the misleading conclusions drawn from neonatal capsaicin pretreatment is presented. 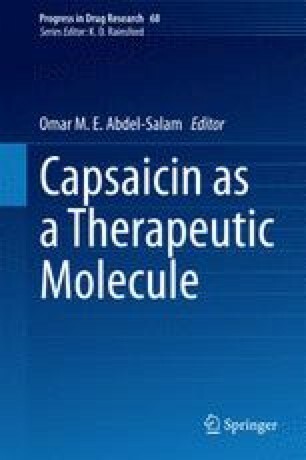 Perspectives opened from cloning the capsaicin receptor “Transient Receptor Potential Vanilloid 1’’ (TRPV1) are outlined and potential molecular mechanisms behind the long-lasting functional, ultrastructural, and nerve terminal-damaging effects of capsaicin and other TRPV1 agonists are summarized. Neurogenic inflammation and the long-list of “capsaicin-sensitive” tissue responses are mediated by an unorthodox dual sensory-efferent function of peptidergic TRPV1-expressing nerve terminals which differ from the classical efferent and sensory nerve endings that have a unidirectional role in neuroregulation. Thermoregulatory effects of capsaicin are discussed in detail. It is suggested that since hyperthermia and burn risk due to enhanced noxious heat threshold are the major obstacles of some TRPV1 antagonists, they could be overcome. The special “multisteric” gating function of the TRPV1 cation channel provides the structural ground for blocking chemical activation of TRPV1 without affecting its responsiveness to physical stimuli. A new chapter of potential analgesics targeting nociceptors is now already supported for pain relief in persistent pathological pain states. This work was supported by the grants of OTKA NK-78059 and SROP 4.2.2.A-11/1/KONV-2012-0024.